We all struggle in parenthood. In some way. At some time. Not every milestone will come easily to every child. Why did I become a child sleep consultant? This. The struggle. My knowledge comes from going through the sleep milestone with EFFORT. That left me to handle the: house, hands-on parenting, nighttime parenting and working part-time. Our son had colic, silent reflux, tongue/lip tie reversal, aspiration, and feeding therapy. Needless to say, I was overwhelmed and tired. What I needed was to get some sleep! Some solid sleep! But, how? Enter sleep training. The funny thing is, during my pregnancy, my husband read many books about sleep and schedules. I wouldn’t listen to him. I told him, “I’ve got this. I know what I am doing. I know how to teach babies how to sleep.” I am a Newborn ICU (NICU) Nurse. I have 18 years experience teaching newborn and sick babies how to fall asleep. And, yet, I still needed to learn how to sleep train. Sleep training healthy babies was not part of my nursing training. It was a humbling moment. I read books, blog posts, and the internet to make a plan to sleep train. I studied for a whole month. Then, I noticed some changes in my son. He seemed ready. At the 5 am feed, he would fall back asleep without the pacifier. I knew in my heart and mind, he was ready to learn how to fall asleep independently. 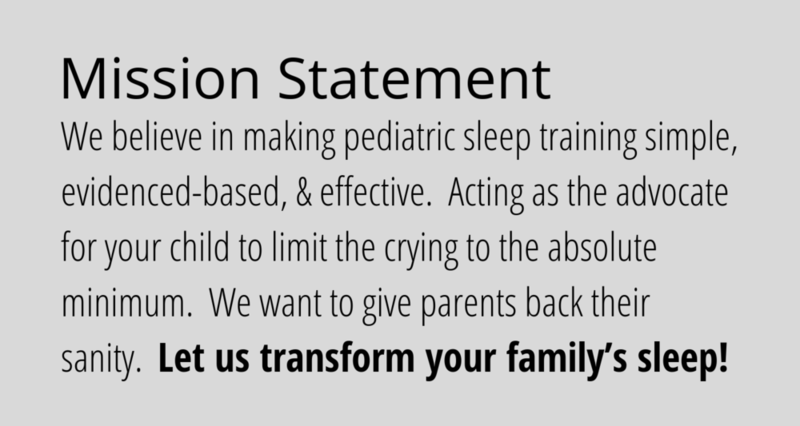 When my son was 5 ½ months old we began sleep training (no checks). We needed to make a pivot mid-training to meet my son’s needs (timed checks). He learned how to sleep independently in less than 2 weeks. He started to sleep from 7 pm - 7 am. It was magical. The rest made me healthy and happier! Goodbye Mombie. Hello, New Mom! "She who does not put her car keys in the refrigerator! " It was such an amazing feeling. Being well rested. I began teaching my friends how to sleep train. And, soon, I began coaching my friend’s friends. Then, I obtained my training through the Family Sleep Institute. I am a Certified Child Sleep Consultant. I use sleep science and love to help coach your family. Let me give your family the gift of sleep. I want your family to be the next Parent Heroes’ success story. Reach out today for a free 15-minute phone call so I can help you select the sleep package that is right for your family. Looking back on my story, it is interesting to me -- that when I was ready for a change, I noticed that my son was maturing and ready too. You will be added to the Parent Heroes newsletter to receive more OUTSTANDING advice on how to get your little one sleeping!